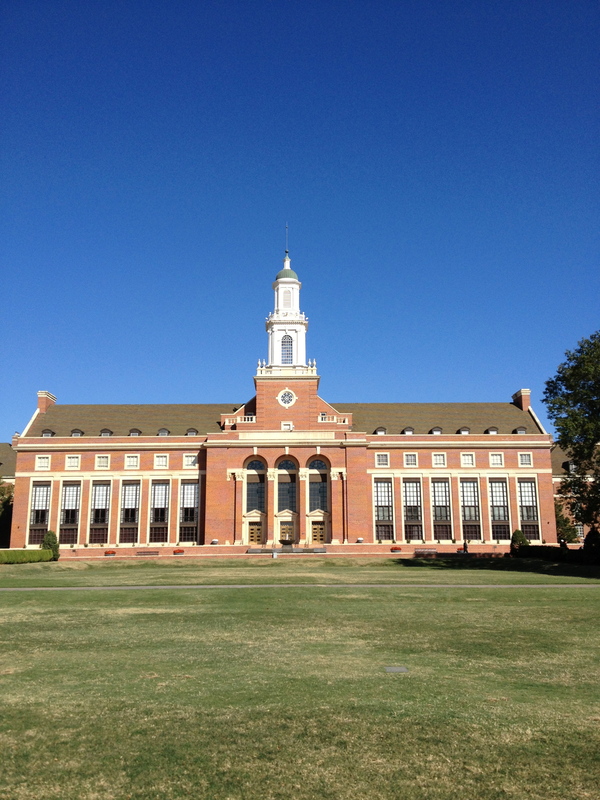 Loyal and True…to our Alma Mater…O…S…U. Those are lyrics from the alma mater at Oklahoma State University, where I spent six years, excepting some summer vacations, as an undergraduate and in graduate school. Fifty-one years after I enrolled there, I have accepted a job working with students on a special project and will be returning weekly for at least the next year. This is a school attended by two of my daughters, two of my sons-in-law and my daughter-in-law. We have ties. Yesterday, I attended the eighth grade assembly at my junior high and high school alma mater, sitting in the same auditorium where I spent another 6 years of my life, from 7th through 12th grades. The same school I have shared with my children and now seven of my grandchildren. Two of my sons-in-law and my daughter-in-law also graduated from this school. We have more ties. At my age, you can’t walk around these places without images from the past swirling through your memory. You watch a high school assembly and your own assemblies flash before you. Teachers and classmates, friends from then, some gone, some still in your life, perform, speak and walk from the 1950s and 6os. When I walk into the halls of the school alone, I see my friends in groups, hanging out before school, giggling and gossiping, too loud or too quiet. Making our way through the halls and through life as a teenager. It’s not even conscious sometimes, but I remember when I get home. And shake my head at how young we were, how sponge-like in our learning, how desperate to be grown up, to be cool, to know what to do in new situations. 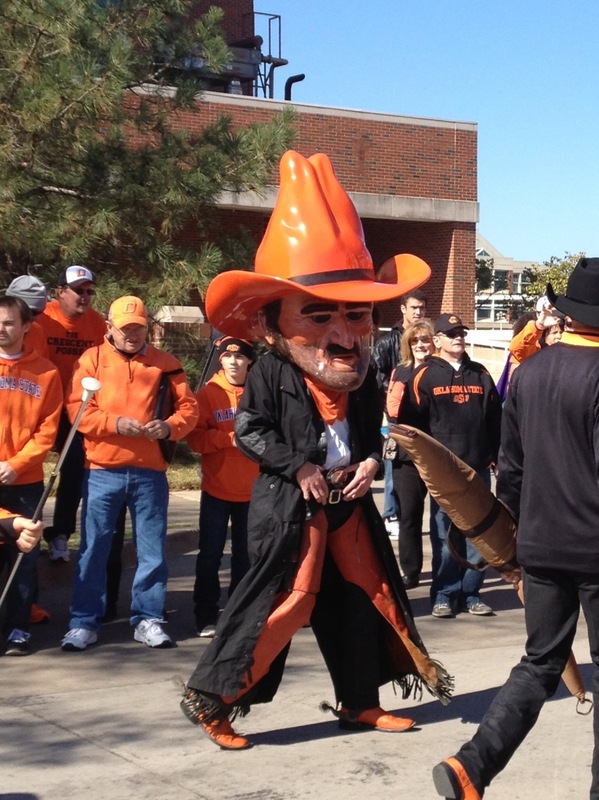 At Oklahoma State, my images are even more varied. I spent my college years there, my first two years of marriage, and became a mother in that college town. I did a lot of growing up in that place and had a lot of fun. It was a big school in a small town and I came from a city. The students had different backgrounds and I learned from them. I can’t walk across that campus without being struck by how familiar it is and how much it’s grown, like everything in the last 50 years that’s managed to stay around. 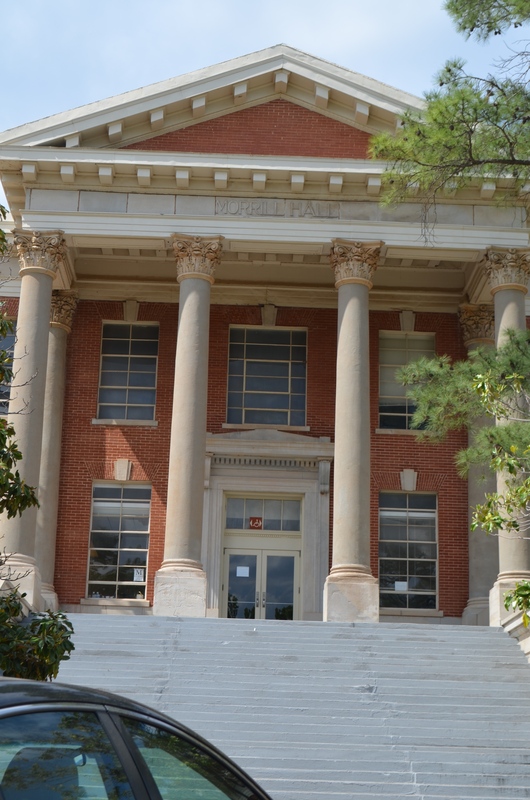 There’s comfort in the familiar…like the first building on campus, Old Central. 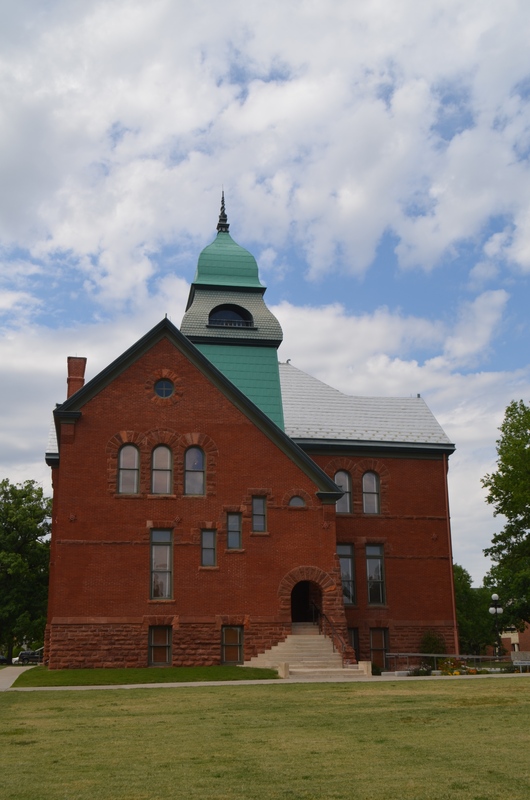 …and seeing the steps to Morrill Hall where I had many of my English classes and taught Freshman Composition for two years. My office was up those steps, I slipped on those steps in the ice when I first got married. Oh, those steps. Every corner has a memory in that town. We stood on Main Street to watch Hubert Humphrey drive by or to watch the Homecoming Parade, a tradition that lives on with Pistol Pete still walking strong. The memories are stronger than ever. Walking from the Student Union, voted #1 in the United States this year, past the library where I spent so many hours going through the card catalogues, researching ever so many papers… I expect to see familiar faces, but I see younger ones, much younger ones. The dorms where I lived are still there, I can see the window of the room where I first saw the Beatles on Ed Sullivan. I drive by the dorm where I spent two years as a student counselor and can count the floors to my room. The duplex where we lived when we married and where we brought our first baby home is still standing, still looking like a cheap college rental place after all these years. The movie theaters we frequented in town are long gone, replaced by a megaplex theatre, The Hideaway, where my husband worked as manager, is still there on campus corner, although it’s moved to a much larger location. Our friend, the owner, who wasn’t much older than we were recently passed away, a pillar of the community. 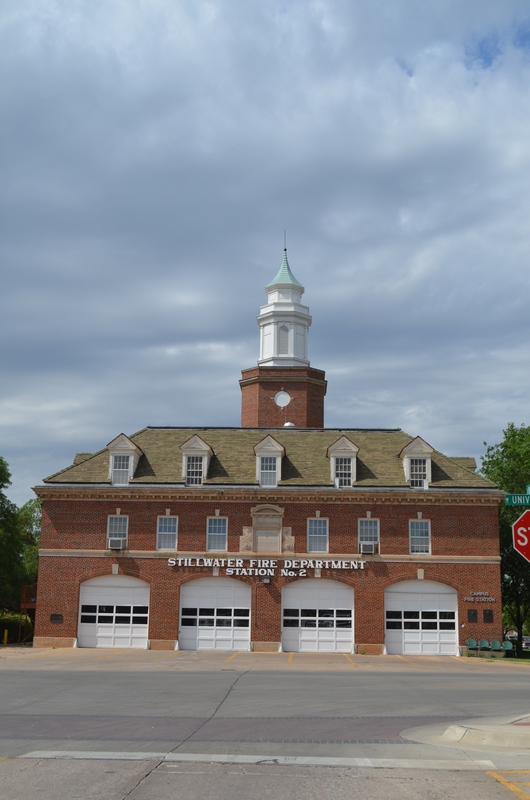 At least the Fire Station still owns that corner, a reminder of the old days. It’s a wonderful thing to be invited to return to a place where there are so many memories to warm your heart. My students will keep me sharp and I can hopefully help them with my experience. They will teach me a lot, I know. How fitting that my last job brings me back to my first jobs on this campus. The old and the new merge into a blur of my life. I’ve got my new school ID, plastic with my picture instead of the paper one I used to carry. There’s a comparison of then and now in everything I do. Then and now. My past and my present merged into another life experience, into new adventures. I’m as excited as a freshman…just old enough not to be as nervous. 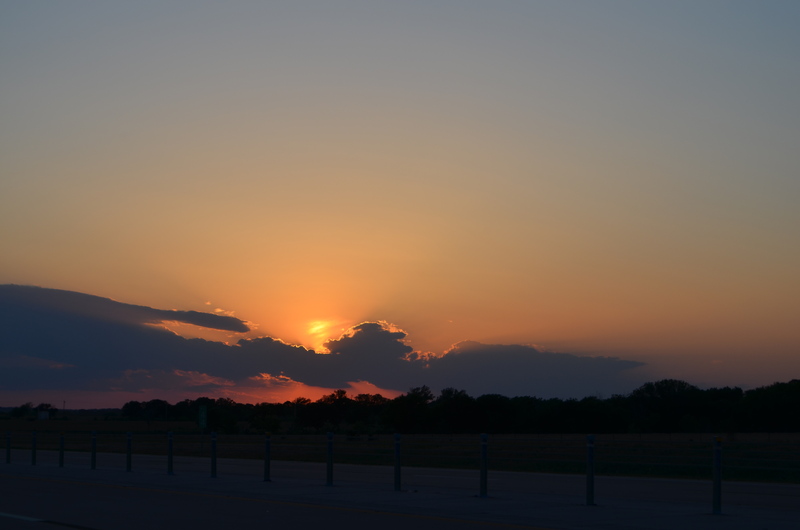 An Oklahoma orange sunset was in my rearview mirror as I drove home this week. Lovely.